ADDIS ABABA (Alliance News) - The Ethiopian government has "systematically and illegally blocked access to social media and news websites," including messaging app WhatsApp and 16 news outlets, according to a report released Wednesday by Amnesty International. The interference, meant to "crush dissent" and prevent negative press, affected access to websites of independent news organizations and political opposition groups, among others, according to research by Amnesty and the Open Observatory of Network Interference. "Our findings provide incontrovertible evidence of systematic interference with access to numerous websites," Maria Xynou, of OONI, said in a news release. "The internet blocking had no basis in law, and was another disproportionate and excessive response to the protests," Michelle Kagari, a deputy regional director for human rights organisation Amnesty, said in the release. "This raises serious concerns that overly broad censorship will become institutionalized under the state of emergency," Kagari said. The Ethiopian government declared a six-month state of emergency on October 8, after weeks of anti-government protests and riots during which at least 50 people were killed in a stampede and more than 2,000 demonstrators were temporarily detained. A report published Tuesday by the Committee to Protect Journalists found Ethiopia to be one of the top five jailers of journalists around the world. On October 2, police and protesters clashed during a traditional Oromo festival held beside a lake in Bishoftu, Ethiopia, just over 20 miles southeast of Addis Ababa. The stampede that ensued left about 100 drowned or crushed to death. Social media soon pulsed with claims that a government helicopter circling overhead had fired into panicking crowds. A helicopter had indeed been there, but it was dropping leaflets wishing all a “Happy Irreecha”—the name of the festival. Still, social media, and the informal news cycle into which it feeds, whirled on. The Irreecha incident is but one of many in a year of turmoil in Ethiopia. Protests that began last November, when Oromo farmers objected to government land grabs to expand the capital and clear space for potential foreign investors, have mushroomed into a movement against the ruling Ethiopian People’s Revolutionary Democratic Front (EPRDF). The Ethiopian diaspora in the United States, which is estimated to number between 250,000 and one million, has been particularly vocal online. Following the Irreecha incident, U.S. overseas activists called for “five days of rage.” Although it is not clear what effect this call may have had, a few days later in Ethiopia, bands of mostly young men attacked foreign-owned factories, government buildings, and tourist lodges across the Oromo region. In response to the upheaval, on October 9, the Ethiopian government declared a six-month state of emergency, restricting the use of mobile data, increasing Internet blackouts, and blocking social media sites such as Facebook and Twitter. At an October 26 press conference Ethiopian government spokesperson Getachew Reda said, “Mobile data will be permitted once the government assesses that it won’t threaten the implementation of the state of emergency." 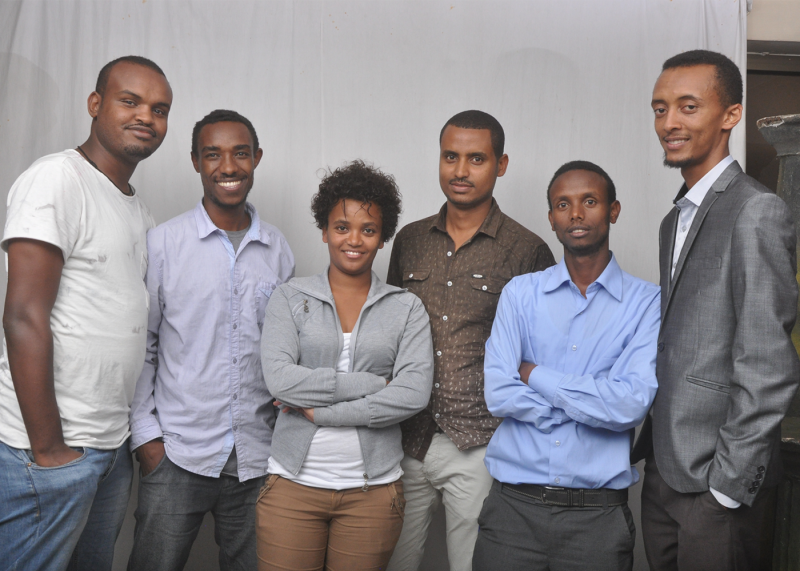 Zone9 bloggers left to right: Abel Wabela, Zelalem Kiberet, Mahlet Fantahun, Atnaf Berahane, Befeqadu Hailu, Natnael Feleke. Image via Martin Ennals Awards. As protests rage over land rights and ethnic discrimination, bloggers and independent journalists in Ethiopia appear to be losing ground in their struggle to exercise free expression. Alongside other recent arrests, four members of the Zone9 bloggers collective, who spent 18 months in prison on terrorism-related charges from 2014-2015, returned to court on October 21 following an appeal by the public prosecutor. Their case was adjourned yet again, with a new court date scheduled for November 15. The Addis Ababa-based blogging collective, six of whom are Global Voices contributors, had worked to foster political debate and discussion in the face of a near-monopoly that the state holds over media outlets. Charged under Ethiopia’s Anti-Terrorism Proclamation with “inciting public disorder via social media” and “receiving support from a foreign government,” the bloggers appeared in court 38 times from July 2014 to October 2015, only to be adjourned each time at the behest of the prosecution, which sought more time to investigate their case. Some members were released without explanation shortly before Barack Obama’s July 2015 visit to the country. The rest were “acquitted” in October of that year, though they were never invited to testify before a jury. And now, a year later, the four members of the group—Abel Wabela, Atnaf Berahane, Natnael Feleke and Befeqadu Hailu—are returning to court once again. With the country in an official “state of emergency,” social media sites are intermittently blocked or banned from use and mobile Internet connections are periodically cut, the need for independent media reporting from inside the country feels ever-more vital — and increasingly under threat. We came to Ethiopia to report on the country’s response to a historic drought. We left with a very different story and a taste of how hard it is for journalists, even those covering what should have been a mostly positive story. For years, Ethiopia has struggled to shed its association with vast human suffering earned during the epic famine three decades ago. Gleaming high rises in the capital, Addis Ababa, are testament to what today is one of Africa’s most robust economies. An infrastructure building boom has connected the farthest reaches of this sprawling nation of 100 million people, many of them now covered by a government social safety net. As a result, even though Ethiopia’s current drought has been far more severe than that in the ‘80s — one-fifth of its population suffers moderate to severe food insecurity — there’s very little of the classic, horrible imagery: the emaciated faces of children with distended bellies, which became the backdrop of those historic famine relief rock concerts. More hours went by before we finally got our “hearing” before five unidentified men. … Each of us was interviewed separately about exactly what our story was, why we chose to go where we did. We went to Ethiopia to tell this new story, that drought does not have to lead to famine. Many experts say planning and good governance can greatly mitigate human suffering. Ethiopia’s government has won some kudos for its drought response this time, yet its abysmal record on human rights, its harsh treatment of journalists and political dissidents can hijack attempts to tell this story. And in our case, it did just that. For foreign correspondents, obtaining a journalist visa requires extensive paperwork, documenting the serial numbers of all equipment down to cell phones, a detailed account of every place to be visited and, once approved — if approved — stern warnings not to deviate from it. The treatment of Ethiopian journalists is far harsher: some 60 of them have fled into exile since 2010, according to the international group Human Rights Watch. The morning after we arrived in Addis, armed with all required permits and paperwork, we set off for the Oromia region south of the capital, shooting images of the extensive housing and road projects under construction or newly completed, some images of farmland and finally a small farm whose owners were being trained in business skills while cultivating new specialty crops to help cope with climate vagaries. It was here where we were summoned by Ethiopia’s “security services” to the police station. It is amusing to reflect now that our first reaction was annoyance: this would rob videographer Tom Adair of the afternoon’s best light. If only that was all we would lose. About two hours into our wait in a dimly lit office, we were told to surrender all electronic equipment, including cell phones, and our passports. No explanation was offered, only the threat of arrest if we continued to insist, as we did, that our paperwork was in order, that it is illegal to confiscate a passport, especially without a receipt. “Report to Immigration tomorrow, and you can collect it,” we were instructed by a plainclothesman who never introduced himself. That meant a six-hour journey back to the capital and to a building teeming with Ethiopians and foreigners alike, applying for passports or visas. In our case, our chance to get our equipment and documents returned. More hours went by before we finally got our “hearing” before five unidentified men. They’d combed through every corner of our luggage in pursuit of hidden cameras or memory cards and demanded to see every inch of footage we’d shot. Each of us was interviewed separately about exactly what our story was, why we chose to go where we did. Our explanation was simple: Oromia was hard-hit by the drought. It is where we planned to film food distribution and other retraining programs run by the government and by Baltimore-based Catholic Relief Services, the largest nongovernment aid group operating in Ethiopia. A CRS official accompanying us was also detained through this ordeal. This was mystifying since his agency, far from being subversive, is a key government partner in relief work. As it turns out, Oromia is also one of several regions that have seen political unrest and protests — unrelated to the drought — which the government has put down violently. In the days just before we arrived, Human Rights Watch reported 100 deaths at the hands of riot police in the Oromia region. It’s fair to assume that the security services were looking for footage or evidence of any encounters we might have had with protests or protesters, highly improbable given that we’d barely arrived in the country. A glance in our passports could attest to that. Finally, 24 hours after they were taken, our passports and gear were returned with the only “official” explanation we would get. “You did not get permission from Security,” we were advised, even though no such requirement is published anywhere. Oromia was now off limits and interviews already scheduled with government ministers about the drought were now canceled. In Ethiopia, “Security,” the National Intelligence Service, appears to hold the biggest sway, enforcers for a government hell bent on controlling the flow of public information and the images it sends out to the world. Internet service was shut down throughout the country in the period just before we arrived, presumably to muzzle social media and to prevent protest images from being exported, a virtually impossible task in this day and age. Nevertheless, footage of the protests were broadcast and distributed. Given that weeks of careful planning (to say nothing of the hefty travel costs) were wiped out by the whims of a paranoid security apparatus, it’s unlikely we’ll be able to return and tell this important story any time soon. Fred de Sam Lazaro is director of the Under-Told Stories Project at the University of St. Thomas in Minnesota, a program that combines international journalism and teaching. He has served with the PBS NewsHour since 1985 and is a regular contributor and substitute anchor for PBS' Religion and Ethics Newsweekly. Earlier this month, the government of Ethiopia blocked multiple social media sites–Facebook, Twitter, Instagram and Viber–for days on end during the course of annual university entrance exams. The government initiated the shutdown in order to prevent students from sharing answers or otherwise cheating on the exams but went on to claim that it had blocked the sites because they were “a distraction” for students. It is not entirely clear from where the order to launch the shutdown came. Daniel Berhane, editor of Horn Affairs magazine, tweeted that there was no transparency regarding who made the decision and that the government issued no statement on how long social media would be blocked for. The ban on social media ultimately only lasted for a handful of days, as long as the examinations were held, but even though the duration of the ban was relatively short, its scope is troubling. Ethiopia is not the first nation to block social media during exams–Algeria and Iraq took the same measures this spring after students published exams online. However, this could set a troubling precedent for government control of the web. The UN has defended the internet as a basic human right and has passed a resolution (albeit non-binding) that condemns nations that intentionally disrupt citizens’ internet access. Internet shutdowns have frequently been used in times of violence or impending violence–like during the terrorist attacks on Istanbul, during protests in Bahrain,Venezuela and across sub-Saharan Africa. There are arguments to be made that preventing people from sharing their location on social media can protect innocent people from being attacked if they are in imminent danger, but social media blocking is more often used to disenfranchise “troublesome” populations. Imagine if social media had been efficiently blocked for the entirety of the Arab Spring. Without social media access, populations cannot share their stories beyond the immediate, local level. In 2015, Freedom House reported that Ethiopia was blocking critical opposition websites, including international news outlets–outlets such as the BBC were jammed by the government. There was presumably no threat to the general populace if BBC ran its stories, there was only a threat to the government’s control of information voters were exposed to going into the election. The UN resolution was a step in the right direction but its non-binding nature means that the council that signed off on it–which included multiple countries that have launched internet shutdowns against their own populace–has no imperative to truly monitor whether the internet is being denied without cause to certain populations. Activist organizations like Access Now work to protect freedom of expression online but short of drawing attention to the problem and encouraging pushback, there is relatively little they can do to block an internet shutdown. VPNs (Virtual Private Networks) have let users in China access Google, Facebook and other blocked websites for years but the VPNs are no longer a secret that governments are unaware of–they are well-publicized tools. As the methods by which the populace circumvents an internet blockage expand, governments are not falling behind. In nations such as Ethiopia where blanket control of social media is a task well within the reach of the government, there is no number of VPNs or new apps that can effectively prevent the disruption of personal expression online. Ethiopians are experiencing a government-imposed social media blackout supposedly targeted at distracted students. After a massive online leak of university entrance exam questions forced the nationwide tests to be cancelled, Ethiopia's government cracked down in a big way, blocking access to social media during the exam retake. Facebook, Twitter, Instagram, and Viber were inaccessible starting Saturday morning. “It's a temporary measure until Wednesday. Social media have proven to be a distraction for students," government spokesman Getachew Reda told the BBC. But many Ethiopians are wary of the implications of this move coming from a government that has a track record of silencing oppositional voices on the internet. Could you pass a US citizenship test? Find out. Ethiopia was one of the first African countries to censor the internet,beginning in 2006 with opposition blogs, and it’s frequently impossible for citizens there to access dissident blogs and human rights websites. TEST YOUR KNOWLEDGECould you pass a US citizenship test? Find out. “This is a dangerous precedent. There is no transparency about who took the decision and for how long. This time it is for a few days, but next time it might be for a month,” Daniel Berhane, the prominent blogger behind the website “Horn Affairs” told AFP. Berhane believes that the Ethiopian authorities are testing new internet filtering tools and gauging the reaction of the public. The government had never before blocked social media nationwide. Previously, people in the Oromo region have reported difficulties accessing some social network sites during anti-government protests there, but the government denied responsibility. A group supporting greater rights for Ethiopia's Oromo people claimed responsibility for leaking the pictures of the test in May that forced the cancellation of the original version of the college exam, in what was widely perceived an embarrassment for the national government. Last week, the UN Human Rights Council passed a resolution condemning the restriction of internet access as a human rights violation. ADDIS ABABA, Ethiopia: The ex-spokesman for Ethiopia's main opposition Blue Party has been charged with inciting violence and being a "ring leader" of a banned rebel group after he criticized the government on Facebook. Yonatan Tesfaye, who has been jailed since December 2015, in one message accused the ruling Ethiopian People's Revolutionary Democratic Front (EPRDF) of using "force against the people instead of using peaceful discussion with the public." He was referring to the authorities' response to protests that have rocked the Oromia region in Africa's second-most populous nation. Home to some 27 million people, Oromia encircles Addis Ababa and stretches over large parts of the rest of the country. It has its own language, Oromo, distinct from Amharic, the language of Ethiopia's government. The demonstrations began in November against a government plan to expand the boundaries of Addis Ababa into Oromia. According to court records, Tesfaye was charged Wednesday with 11 counts including inciting violence "to disrupt the social, economic and political stability of the country." He is also accused of being a "ring leader of the far-left Oromo Liberation Front (OLF) to inflame demonstrations," the court records said. OLF is a banned separatist movement opposed to the Ethiopian government which police routinely blame for "terrorist" acts. Authorities consider Tesfaye's writings as a call to rise up against the government and given the country's tough anti-terror law he could face up to 15 years behind bars if convicted. Tesfaye was until recently the Blue Party's spokesman and comes from a generation of young activists determined to challenge the authoritarian regime that has ruled the nation for 25 years. "When people become popular and give a voice to the voiceless, (the government) charge them with fabricated charges and put them in jail," Blue Party head Yilkal Getnet told AFP. "This is what happened to Yonatan," he added. Since the overthrow of a Marxist junta in 1991, Ethiopia's political and economic situation has stabilized, although rights groups have criticized the government for suppressing opposition. The cable news channel Al Jazeera America, which debuted in 2013 to great fanfare when it promised to cover American news soberly and seriously, will be shutting down by the end of April. The move was announced at a companywide meeting on Wednesday. 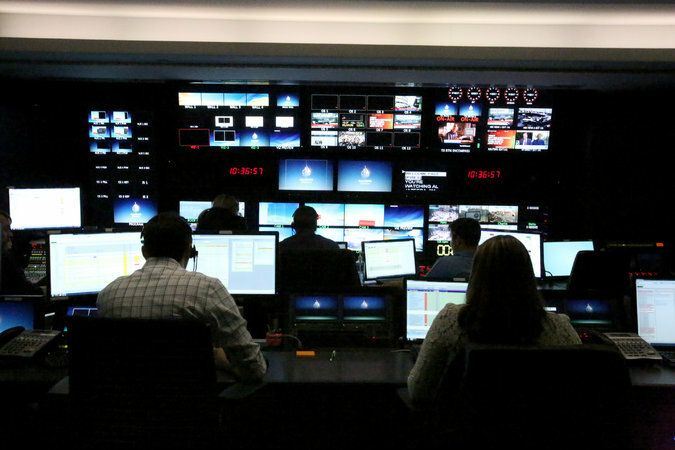 At the companywide meeting, Al Jazeera America staff members, some in tears, were told that the decision to shutter the network had not been unanimous. Some of the channel’s leadership argued that the network provided an important service, and continued to win awards for its coverage. But in the end, the decision was an economic one. The channel, it was felt, had fallen victim to the lack of a business model beyond continuous support from Qatar, the energy-rich country that owns Al Jazeera. Some staffers saw that as a tacit admission that falling oil prices were behind the closure, though a spokeswoman for the company denied that on Wednesday. Beyond its oil wealth, Qatar is one of the world’s top exporters of liquefied natural gas, whose price has also tumbled. Al Jazeera America went on the air in August 2013 after Al Jazeera bought Al Gore’s Current TV for $500 million. It promised to be thoughtful and smart, free of the shouting arguments that have defined cable news in the United States over the last decade. But meaningful viewership never came, with prime-time ratings sometimes struggling to exceed 30,000 viewers. To make matters worse, turmoil hit the newsroom last year when staff members complained bitterly of a culture of fear. There was an exodus of top executives, along with a pair of lawsuits from former employees that included complaints about sexism and anti-Semitism at the news channel. In May, Ehab Al Shihabi, the chief executive of Al Jazeera America, was replaced by Mr. Anstey. Morale improved, but ratings remained low. The closure, which will cost hundreds of employees their jobs, highlights the difficulties of establishing a robust cable news presence in an increasingly crowded media marketplace, and one that faces ever more competition from the web — the ultimate 24-hour news medium. Current TV, before being bought by Al Jazeera, had struggled for years to find an audience, and to define its place in the news landscape. Fusion, a cable news network and digital publication aimed at younger audiences,lost the backing of one of its corporate parent companies, Disney, in recent weeks, following reports that it, too, had struggled to find its footing with audiences. Even established players like MSNBC have been forced to revamp in recent years. 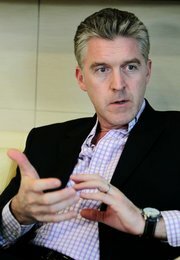 Andrew Heyward, a former president of CBS News who is now an adviser to media companies, said in an interview that Al Jazeera America had faced an uphill battle from the beginning. Cable news “is a very well-served market, not to say saturated, and you have three powerful, well-established players,” he said, referring to Fox News, MSNBC and CNN. “Endemically, it’s not quite clear that the world was waiting for a new 24-hour cable channel in the U.S., and cable operators certainly weren’t waiting for it,” he said, describing the limited distribution the channel received. “They came kind of swaggering into the arena, saying we’re going to do higher-end stories and represent people who are under-represented,” Mr. Heyward said, a proposition that played better on paper than in practice. And the network brought something of a British sensibility and judgment, he said, which did not translate as well to cable news as it might in other arenas. “This is not ‘Downton Abbey,’ ” he said. All these problems were exacerbated, he said, by the fact that a brand associated with the Arab world was a tougher sell in the United States than it was in Europe. And Al Jazeera America has not been free of controversy in recent months. In November, the news station’s general counsel, David W. Harleston, was suspended following a report in The New York Times that he did not appear to be licensed to practice law. Among the varied legal work Mr. Harleston had done for Al Jazeera America was his involvement in wrongful termination lawsuits brought by former employees. Legal experts have cautioned that Mr. Harleston’s lack of a law license could potentially leave the network vulnerable in those lawsuits, primarily over issues of confidentiality. On Dec. 27, Al Jazeera America aired an hourlong documentary that linked some of the biggest stars in Major League Baseball and the National Football League to performance-enhancing drugs. The most prominent athlete mentioned was the Denver Broncos quarterback Peyton Manning, who angrily denied the report, calling it “complete garbage” and “totally made up.” The baseball players Ryan Howard and Ryan Zimmerman have filed defamation suits against the network.